Eowan Ivey’s To the Bright Edge of the World had me remembering the startling blue of the icebergs and the crisp cold of the Alaskan air when I visited several years ago. Ivey’s story is based on the actual 1885 expedition of Colonel Allen Forrester, and references diaries and letters from the exploration of the newly acquired Alaskan Territory as the foundation for a compelling epistolary novel. The real Forrester explored over a thousand miles of wilderness and become the first to chart the Copper River, leading an expedition as significant as Lewis and Clark’s. The novel uses the imagined letters of Colonel Forrester to his wife, Sophie, as well as his formal accounting of his findings as he travels the unexplored Wolverine River area in Northern Alaska with a small crew. Forced to remain behind because of her pregnancy, Sophie keeps her own journal and sends letters to her husband. When she miscarries, Sophie, a former schoolteacher with a penchant for studying birds, purchases a camera, and embarks on her own expedition to capture pictures of nesting birds in the woods surrounding her home at Vancouver Barracks in Washington. As Allen Forrester suffers starvation, disease, and bitter cold traveling through uncharted Territory, he also discovers the power of the local culture, and Ivey weaves old otherworldly legends into her tale, treating them with respect and awe. The women with feathers growing out of their wrists, calmly washing clothes by the river full of geese; the old medicine man with the black hat who can fly and transform into a raven who steals Sophie’s hair comb; the monster in the river who almost kills one of Forrester’s men – all add flavor to the steady reporting of the mundane as well as the explorer’s battle with the unforgiving elements of nature. Ivey grounds the story in the present by creating a fictional descendant of Forrester, Walter, who is seeking a home for the artifacts and papers he has inherited. Walter is getting old, and has started a correspondence with Josh, the museum curator in Alaska, who has agreed to digitize the papers and establish an exhibit. Through Josh, Ivey offers pictures interspersed through the narrative, and updates on the current political and environmental turmoil. Ivey muses on the power and beauty of Nature, and comments on the disconnect between preserving the culture of the past while moving on with demands of the present. To the Bright Edge of the World combines adventure, history, and romance with discovery – not only of forbidding new land but also of inner truths. As a reward for both Allen and Sophie, as well as for the reader, Ivey projects a fictional continuation in the ending as the couple continues to explore – both plausible and satisfying. A fellow reader suggested this book would be both engaging and uplifting – she was right. English professors write the best letters of recommendation, but beware. They can kill you with articulate faint praise (and sometimes vitriol) – and you won’t even know. 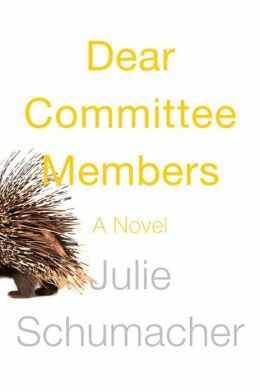 In her epistolary, Dear Committee Members, Julie Schumacher chronicles the life of an English Professor – from the idiotic to the sublime – through his letters. As the letters progress through the academic year, Jay Fitger reveals his relationships with colleagues, students, former wives, current lovers, literary agents, and Payne University where he is a long-time tenured professor of English and Creative Writing. Without tenure, he could not have survived, and with true academic justice, he eventually becomes one of the administrators he consistently criticizes. Jay Fitger never refuses a request for a letter, and he always tells the truth. You won’t have to read too carefully through the abstruse wording to get the witty references. Sadly, computerized forms and electronic messaging are replacing letter writing. Stamps are becoming extinct and writing paper may soon be hard to find. Ironically, I read the book on my iPad. But, within the context of letters, Schumacher humorously demonstrates how language can be its own reward, and tells a good story with it.